Last night I found myself searching in deepest SE16, through dark, dripping railway arches and anonymous industrial estates, for a man who washes cheese in beer. A few years ago I might have considered this rather out of the ordinary but of all the strange places this blog has led me over the years, from a Finnish church in Rotherhithe that had an attached sauna, to a meal involving the dissection and consumption of an entire roasted sheep's head, this almost counts as normal. I was looking for Mootown, a company that imports small-farm Welsh cheeses and distributes them to the best London cheese shops but has recently launched its very own product and invited me along to learn more. The story goes that Mootown once shared "office" space (actually just one of the aforementioned railway arches with a door on the front) with brand new craft brewery Kernel, who were making quite a name for themselves with their punchy, hoppy IPAs. 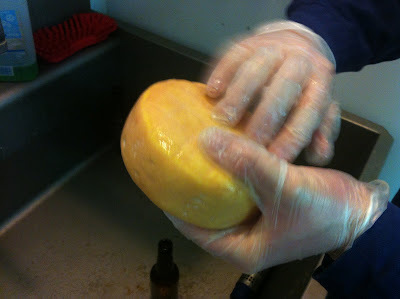 As with any brewery, there's inevitably some wastage with bottling issues and technical problems, and at the same time Mootown noticed that one of the cheeses they were selling, Golden Cenarth by Carwyn Adams, tended to arrive quite young. 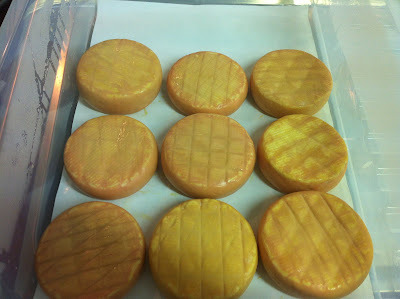 So in one of those wonderful moments of serendipity, Mootown decided to start ageing and triple-washing the rinds of the Golden Cenarth in the Kernel spoils, and selling the result on as Bermondsey Spa. It's a fantastic story, of course, but would mean little if the new product wasn't worth all that extra effort. 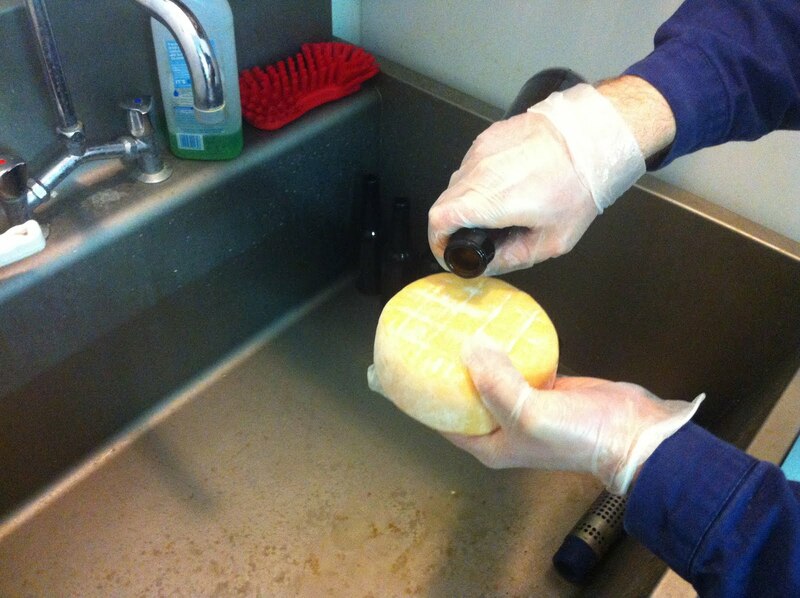 Fortunately, Bermondsey Spa is a great little cheese. 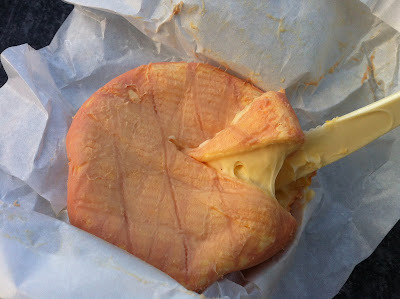 The rind is orange and sticky like a fine Epoisses, but interestingly (possibly due to the pasteurised milk; Epoisses is raw) the taste of the flesh is more like a Camembert - it has bags of creamy, salty flavour but it's not harshly sulphuric, nor does it smell like a dead animal. It's very well balanced, refined and carefully constructed and whilst isn't demanding in the way that some of the stronger versions of this style are (Stinking Bishop perhaps, or Ardrahan) is nevertheless hugely enjoyable and dangerously edible. The two of us polished off the best part of an entire 250g box in about half an hour, a task that I'm not sure would have been quite so easy with a similar amount of anything stronger, although I've been known to underestimate my abilities in this department somewhat. 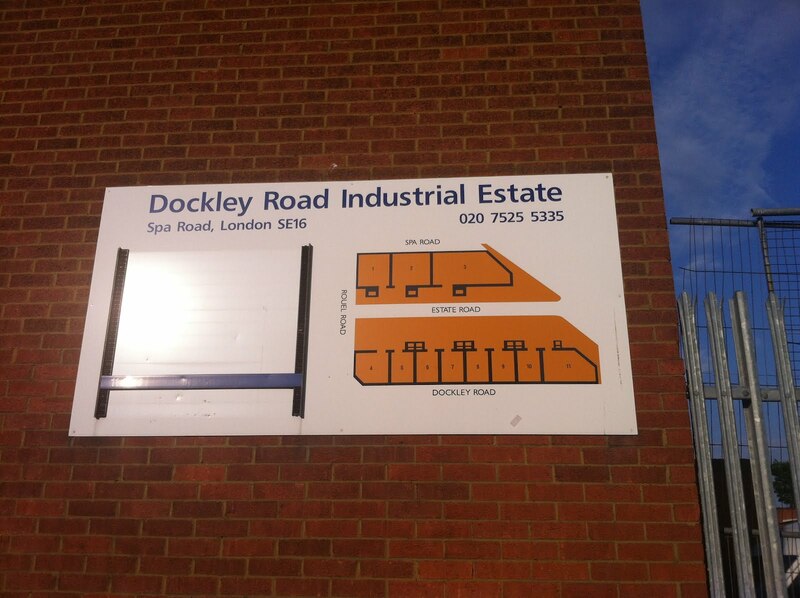 So, Bermondsey Spa comes highly recommended; your next job is finding it. I know of two shops that may stock it on occasion - Neal's Yard, and also posh butchers Moen's in Clapham - but with such a small rate of production, limited both by the rate at which the original base cheese arrives in London and the rate at which they can be washed by hand and stored in that railway arch in Bermondsey, it will most likely remain a rarity. But I imagine that will just add to its appeal; keep your eyes open and a space on your cheeseboard, and if you ever see it for sale (RRP is £10-ish I believe), snap it up. Oh, and it probably goes without saying, it matches very well with a bottle of cold Kernel beer. Many thanks to Brad of Mootown for showing us round, and for the free sample. How hard is it to make a Yorkshire pudding? It must be fiendishly difficult because I've yet to find one in London worth eating in nearly a decade of trying, and I've tried at some fairly expensive places. My grandma, back in the day, used to make a brilliant Yorkshire pudding, so I can only assume she was some kind of undercover culinary genius and was holding secret gastronomic masterclasses in between watching Countdown and checking her pools numbers. If the only Yorkshire pudding I've ever had in my life that was any good was cooked by an octogenarian in a small kitchen in Maghull then what's everyone else's excuse? My grandma is a better chef than most in London. That's the only explanation. OK so yes, I am being facetious, I admit it. 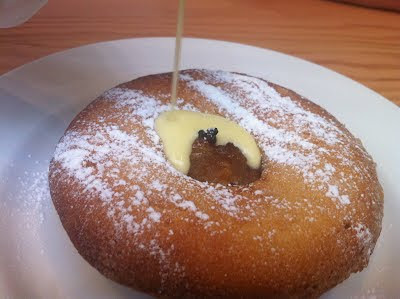 But come on guys, it's fried batter. If you can't make a good Yorkshire pudding then firstly you should be thoroughly ashamed of yourself but more importantly, don't even try. And how to tell when you can't make a good Yorkshire pudding? Easy. It may be one of the following - cold, chewy, dry, tasteless and bready. 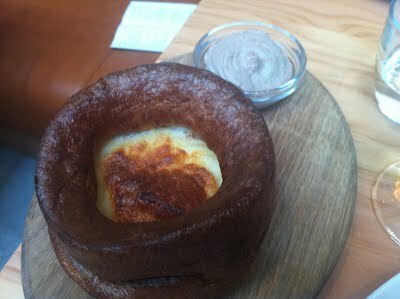 Or, it will be all of these at once, like the Yorkshire pudding I had at the Tramshed last night. It came with a teeny bowl of the fancy-sounding "whipped chicken livers" but which was actually a very ordinary and slightly bitter chicken liver pate, and one that had been left hanging around for a bit as well because it had started to discolour on the outside. 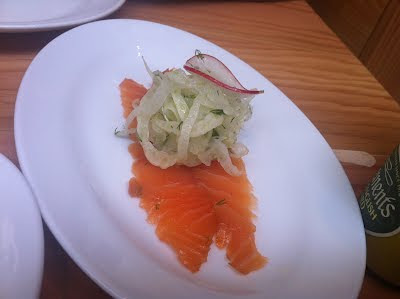 Also as part of the trio of starters was a couple of thin slices of very ordinary smoked salmon topped with remarkably bland shaved fennel, and a plate of underseasoned beetroot puree with a few roast walnuts and boiled beets scattered on top. 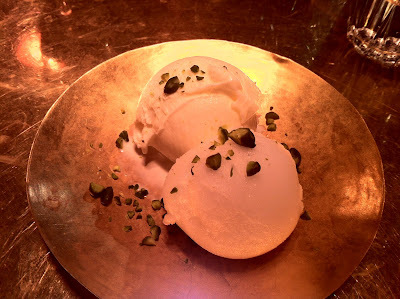 It is both my privilege and my curse as a food blogger that I can point to other restaurants that do most of the above much better, but perhaps it's unfair to compare. For £8 a head it was an interesting selection of starters, at least on paper; it was just a shame none of it tasted very good. A 250g steak - there was no choice offered of cut, just "sirloin" so I don't know what happens to the rest of the cow - was actually pretty good. 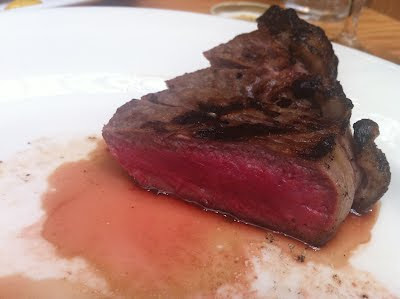 I liked the charcoal-char on the outside and it was nicely medium rare, so it just about justified the £20. 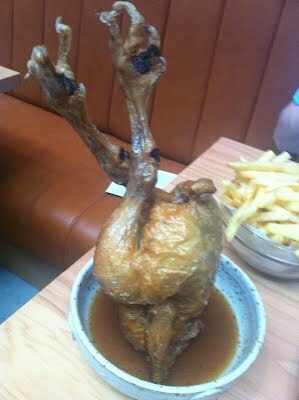 Chicken though was bizarre, and I don't just mean the way it was served on a spike with its legs in the air. 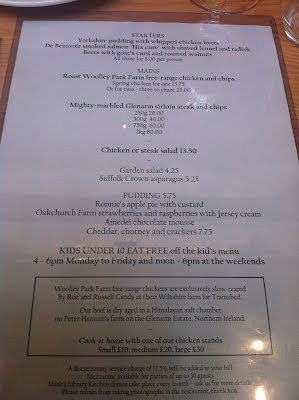 The flavour was incredibly chicken-y. That sounds like a good thing, but let me explain. It was far too chicken-y. 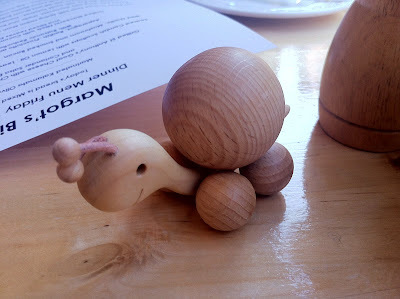 Suspiciously chicken-y. A kind of super-concentrated stock-cube chicken flavour, chemically powerful and deeply unnerving. The same flavour infested the chips, which were nicely fried but had been treated, so we were told, in the "chicken dripping". "These taste," said my friend after chewing thoughtfully on one for a few moments, "like Walkers Roast Chicken flavour crisps". I'm not accusing the Tramshed of using stock cubes or artificial flavours of any kind, it just really, really tasted like they had. Desserts were less troubling, but no better than the starters. 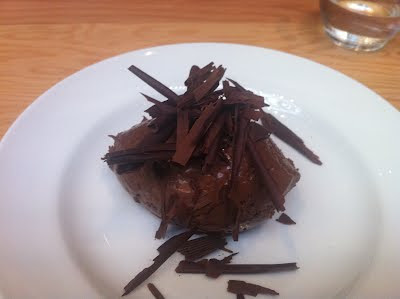 A chocolate mousse was a one-dimensional lump of whipped chocolate and fine only in the sense that there aren't very many reasons why you wouldn't want to eat some chocolate. Apple pie and custard was equally uninspiring - the best you could say about it was that it was edible, so it did get eaten. But I wouldn't want to do it again. Perhaps Mark Hix gaffs just aren't for me. I know he has his fans, and indeed a few people responded to my tweet about the disastrous Yorkshire pudding that theirs had been fine. Maybe some people would like their chickens to taste like they'd been dipped in a vat of Knorr as well, or their fries to taste like something from a packet. Maybe these places are more about the attitude, the atmosphere and the buzz than anything that ends up on a plate. 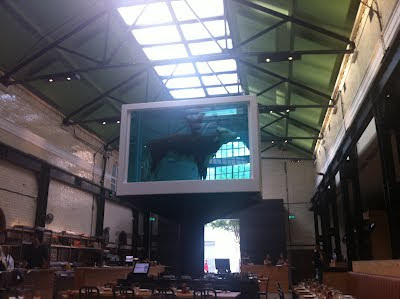 But we honestly didn't enjoy ourselves at the Tramshed, and though that may have partially been due to the fact the room was baking hot (there's no air conditioning, and only a few lucky tables have fans directed towards them) mainly it was because most of what we ate veered between boring and bizarre and managed to cost £88 with only 3 glasses of wine. 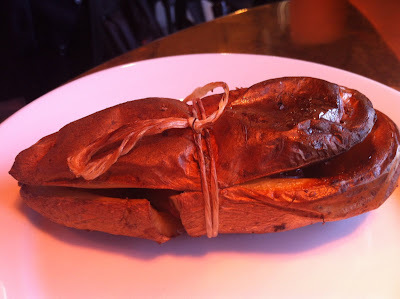 And for all those reasons, not least the terrible Yorkshire pudding, I don't think I'll be back. The trend in recession-hit London, I daresay you've noticed, is towards large-volume, no-reservations, low-cost restaurants. 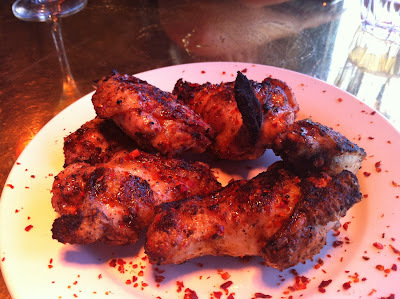 MeatLiquor, Pitt Cue, Spuntino and Koya have all popped up in the last couple of years, each serving wildly different cuisines but all very similar in terms of business model - pack 'em in, queue 'em up, and make sure you can have a couple of courses and a drink for less than £20. These places have something else in common as well of course - they serve some of the best food you can find in the capital - but I'm not sure they would have existed, or at least been so wildly successful, had hard economic times not forced the choice between cutting corners on quality ingredients or making sure you turn enough tables to turn a profit. But there has long been a way to get a fresh, exciting meal for a very reasonable amount of money and have the peace of mind of a reserved table. 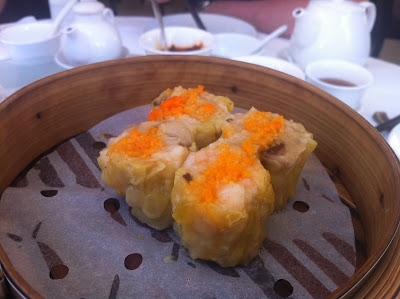 Dim sum is the great unsung hero of budget dining, a way of trying a stunning variety of meticulously prepared dishes for something approaching a pittance, and is one of the very best ways of eliminating a Friday-night work-drinks hangover that I know. 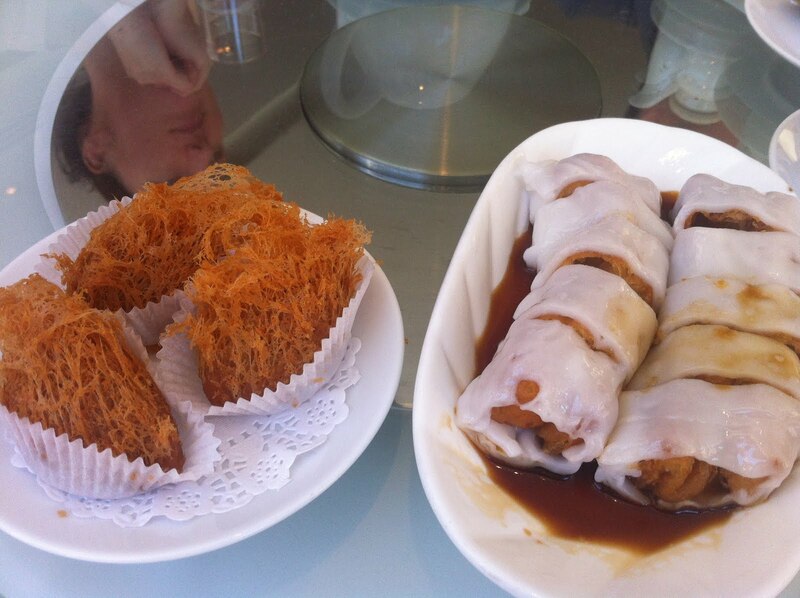 My favourite dim sum spots so far, however, have been a little out of the way - Dragon Castle is highly recommended if you can steel yourself for the horror that is the Walworth Road, Dragon Palace in Earl's Court is a little more accessible but has the disadvantage of the most astonishingly rude service I've ever encountered, and if you can find a better way of getting to the Peninsula in Greenwich than hacking your way through the bushes circling the car park then you're a better person than me. 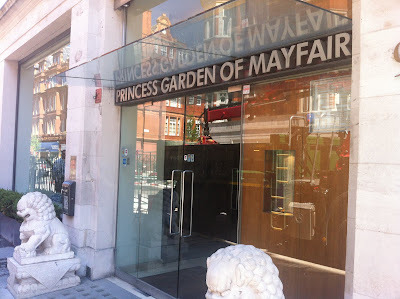 That Princess Garden deserves to be recognised amongst the best dim sum London has to offer, then, is even more extraordinary in the context of its location - right in the heart of Mayfair, minutes from Oxford Street and occupying a large chunk of what must be some of the most expensive real estate in the world. This part of town is more closely associated with Chinese restaurants like Kai and their £55 abalone soup than no-frills steamed dumplings and pots of jasmine tea but here it is anyway, a smart, bright space populated by smart, brisk (if occasionally brusque) staff and a particularly nice place to spend a Saturday lunchtime. There's no point me attempting to go into too much detail on the food, partly because I'm seriously out of my depth attempting to explain exactly what goes into most of it anyway - the silky noodly casing of a cheung fun will always remain black magic to me - but mainly because the sheer number of different bits and pieces we tried makes such a task impractical. But the highlights are worth pointing out - perfect greaseless taro croquettes, all crunchy and spindly on the outside and containing a rich, salty vegetable paste; a variety of piping hot dumplings in various shapes and sizes, all soft and fresh; a really interesting pan-fried glutinous rice dish, sort of a flat rice pancake; some golden baked char siu bao (pork puff things) with a good sweet piggy filling; and of course the aforementioned cheung fun, a cuttlefish version in particular boasting the flavour and bounce of great fresh seafood. 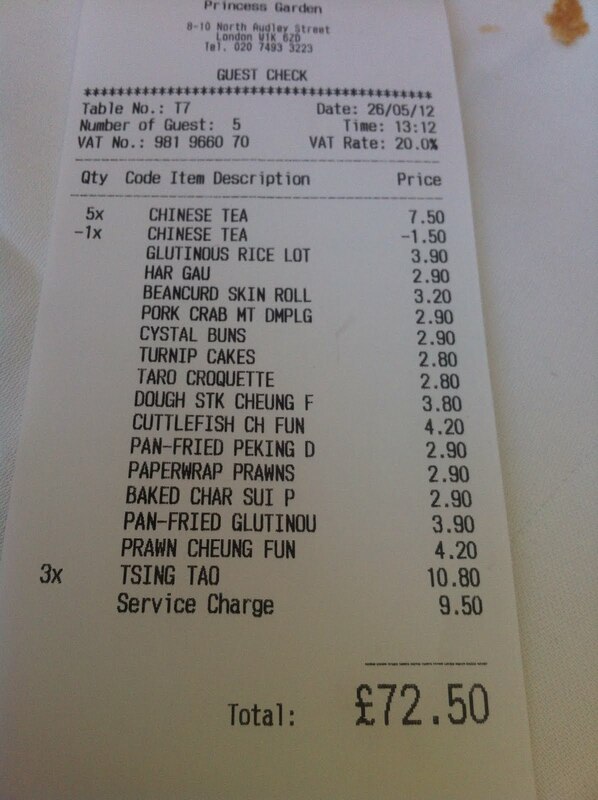 A very generous feed, then, and not a single item (apart from some slightly chewy beancurd skin rolls) less than hugely enjoyable. It seems a bit of a shame to have to mention the service, which whilst always efficient and never exactly wrong, could have been a bit friendlier. "Do you have any soya milk please?" "NO." 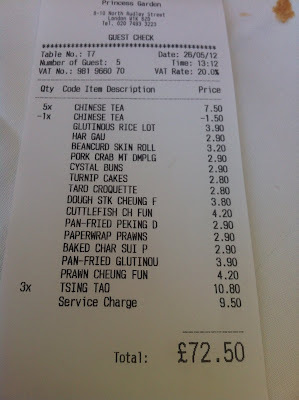 went one memorable exchange, but once the food started arriving most was forgiven, and once the bill arrived, it all was - just £15 a head and a couple of us even had a beer. A genuine bargain, in Mayfair, in 2012, and not a queue in sight. As has been proven time and again the world over, from Leicester Square to Times Square, from the Champs-Élysées to the Ramblas of Barcelona, tourist hot spots and good restaurants do not go together. If you find yourself able to fill every seat no matter what kind of garbage you're serving, then why bother to actually be any good? Why go to the extra effort of using nice ingredients when you can make a fortune marking up cheap crap? Why have friendly, knowledgeable and engaged waiting staff when most of the people you're serving are only in town for a couple of days, and you'll never see them again? 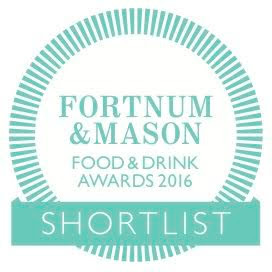 Which is why Margot's in Padstow is so extraordinary. It doesn't have to be this good - it's sat in the middle of one of the prettiest and tourist-trodden villages in Cornwall, and I'm sure they could double their prices and start microwaving Asda ready meals and still turn a healthy profit. Admittedly they have some competition from Rick Stein (who appears to own half the town) and Paul Ainsworth who each run very well-regarded (if pricey) restaurants, but from a cursory glance at some of the other menus in town, there appear to be plenty of places happy to charge the best part of £20 for a semolina-flour pizza and glass of coke. Clearly there is money to be made in mediocrity in this town. Fortunately, wonderfully, there's nothing mediocre about Margot's. 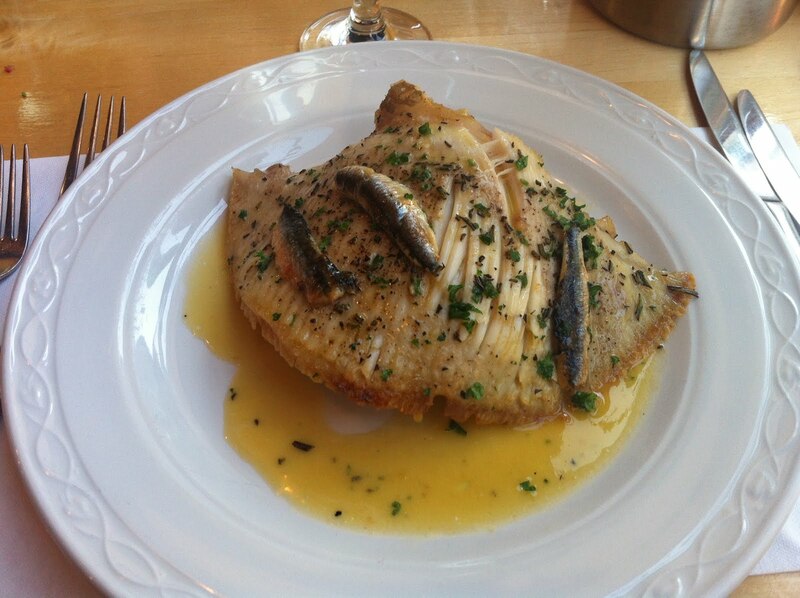 A golden roast skate (sorry - ray, it specifically said on the menu) wing, topped with anchovies and doused in a silky herb butter sat on top of a generous pile of creamy mash. The flesh drew off the bones with happy ease, and had a thick, meaty texture of perfectly cooked Dover Sole. I can barely remember having a better seafood dish anywhere. 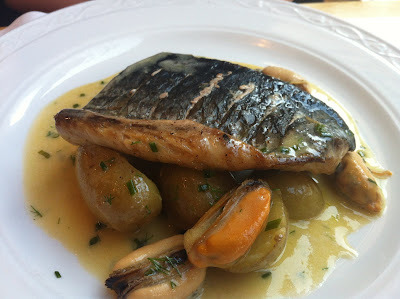 A slab of Silver Mullet, encased in a perfect crispy skin, came balanced on some new potatoes and a some juicy fat mussels. Another lovely thick butter sauce, shot through with tarragon I think, held all the ingredients in its warm embrace, and the flesh of the fish itself was declared "perfect". And you can't improve on perfect. You'll notice from the pictures that this isn't fancy, foamy, Michelin-starred gastronomy - it's comfort food, unpretentious and homely but using top-notch ingredients and cooked properly. 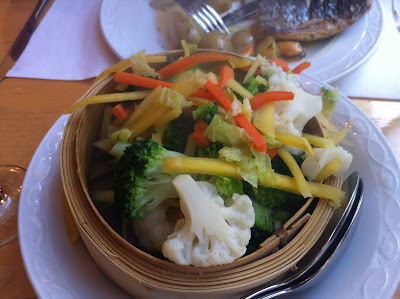 Even a basket of steamed vegetables were timed well, retaining just the right amount of bite and keeping the flavours of each element distinct. 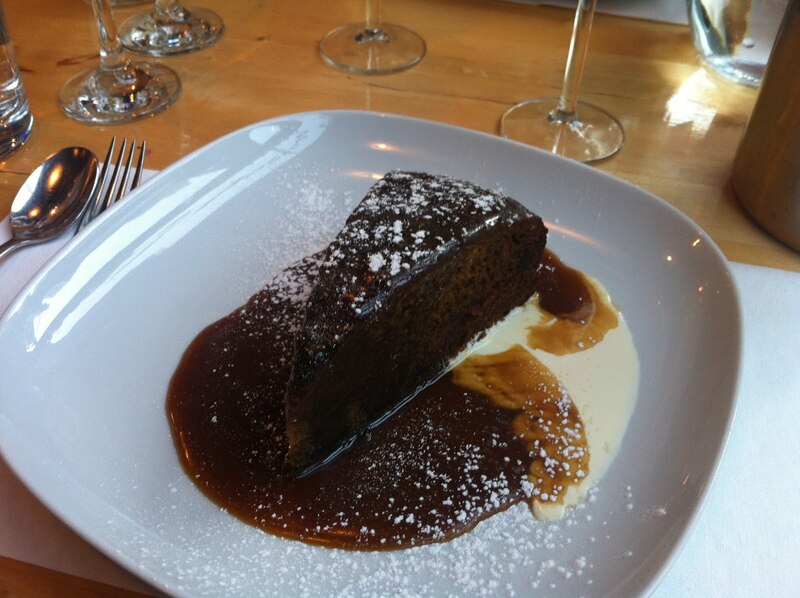 There was only one dessert - the Sticky Toffee Pudding. Actually, that's not true - there probably were other desserts, but I'm afraid I only got as far as the first item on the menu before making up my mind. It was fantastic - a massive slab of treacly goodness, but surprisingly light and dangerously easy to eat. We had one each. 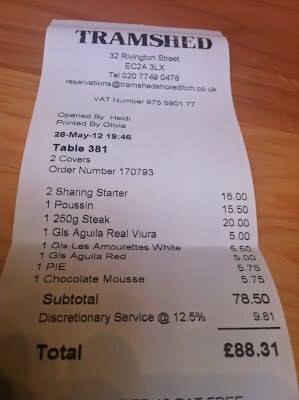 The bill, with a bottle of Picpoul de Pinet, a nice dessert wine and (charming) service added, came to just under £45 a head. A not insignificant amount I suppose, but we probably could have gone easier on the booze if we'd really wanted to keep the costs down. Which, spirits fuelled by lovely fresh seafood and a bracing walk around Padstow harbour to look forward to, we didn't really. 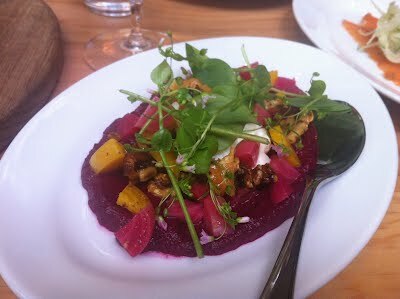 So yes, I thoroughly enjoyed Margot's, and you will too, if you can ever get a table - befitting the honeypot location and reasonable prices, even in early May the place was booked up, and in season scoring a dinner here is nigh on impossible. So why am I making things even worse by lavishing yet more praise on somewhere that is already comfortably oversubscribed? Well, because it's so much better than it needs to be, it doesn't charge the earth and it doesn't compromise on quality in the face of hordes of undemanding tourists. And for those reasons, Margot's deserves all the attention it can get. I promise I don't have any grand designs to morph into a travel blog - invitations like this will probably remain a rarity, and I have a sneaking feeling there's only so much you can say about a hotel room ("tea and coffee making facilities were, again, adequate"). But when someone offers a free weekend in a four-star hotel in one of the most attractive parts of the country, well, there are some things you don't say no to. So I'm going to try my best to make What I Did On My Holidays relevant and interesting (or at least as relevant and interesting as anything else I write, ie. not very) and remain stubbornly objective in the face of extreme PR generosity. It's really the least I can do. This won't be news to anyone who's ever been themselves, but Cornwall is breath-taking. Mawgan Porth, in particular, looks like it's been created by the CG team that worked on Lord of the Rings - a vast golden beach stretches in a long, gentle arc from the brightly-coloured town to the azure surf, and is framed on either side by dramatic green cliffs edged with purple heather. During the day, surfers in dark wetsuits trail across the sands to the water while seabirds circle lazily around their cliff-side nests above. At night, and when the tempramental English weather allows it, an open window allows the water's distant roar to send you off gently to sleep, a soporific soundtrack created by a mysterious combination of the crashing waves and echo from the cliffs. Relaxing doesn't begin to cover it - it's life-affirming and soul-cleansing - just being here feels like it's doing you good, and in fact probably is. The Bedruthan Steps hotel knows how to make the most of its surroundings, as well. My room had floor-to-ceiling windows that slid open so you could take in the incredible view, and both restaurants, and the bar, also pointed the same way. It's not the most attractive building from the outside, is the Bedruthan, so to be in a seaside room staring out is probably the best place in town to be - some of the "villa" rooms further down the hill were hidden under turf in that curious way some places do when they're trying extra hard to show you how eco-friendly they are - but the main building is a 60s office block in white paint, right at the top of the hill so you can't miss it wherever in the bay you happen to be. Sister hotel the Scarlet is altogether easier on the eye, but they don't have as many swimming pools so you know, swings and roundabouts. I should, in the interests of absolute objectivity, point out a few quirks I came across at the Bedruthan that while not spoiling the stay by any means, were slightly odd. Firstly the bed in my room was very short. I am not a tall person, 5'7" at a push, but if I lay out flat with my head on the pillow, my feet stuck out over the end of the mattress. Perhaps people were shorter in the 60s. Secondly I'm afraid I can't recommend anything from the bar other than the champagne and beers; I ordered a martini from a painfully shy teenager on duty one evening, and the poor guy broke every golden rule in the book, using vodka, shaking it and serving it in a warm glass. It was only £7 I suppose but my tip is to have your pre-prandials at the Scarlet, where they make proper drinks and you pay through the nose for them, as it should be. Perhaps I should also mention the food. 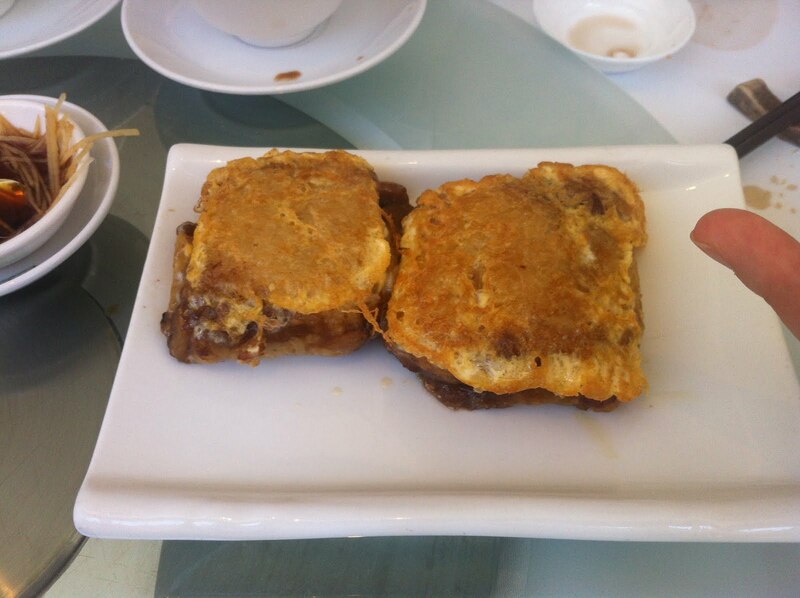 The Wild Café is the less formal dining option, and is also where you grab your traditional hotel buffet breakfast. There was plenty of guff on the menu about how careful they are sourcing every bit of everything (Apple juice supplied by Cornish Orchards of Liskeard, Honey supplied by Heatherbell Farm of The Lizard, Free-range eggs from Manor Green of Newquay, and so on) but in the end this was nothing out of the ordinary; on the last morning I paid £4.50 extra for a very decent Eggs Benedict though so I should give them that. A lunch here, too, was fairly unremarkable. I had smoked salmon sandwiches because they'd run out of the daily special Cornish Chowder at 2pm, and a pepperoni pizza was like something from Tesco's. But none of it was unreasonably priced, service was always charming and, all said and done, there's always That View to bask in. I'll forgive most things for That View. Back in 2009 I spent a long weekend in yet another devastatingly attractive part of Cornwall (the place is full of 'em), St. Ives. 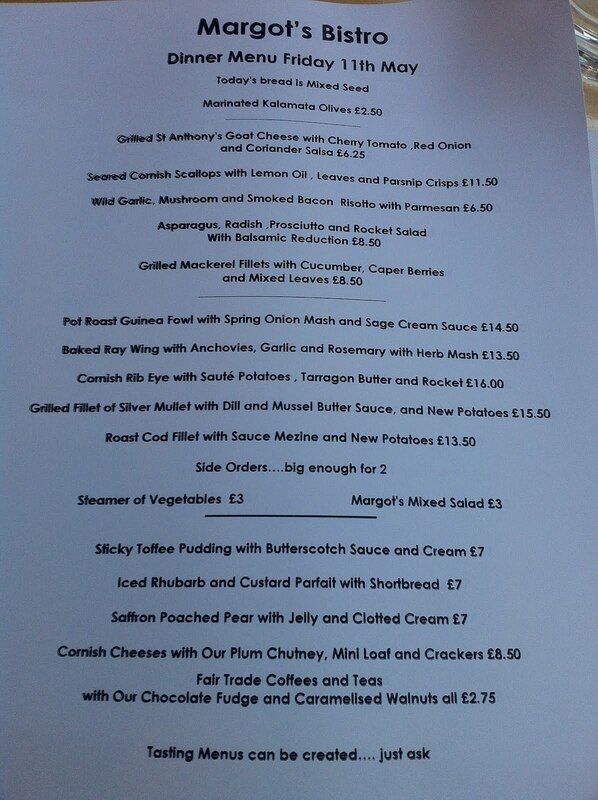 Highlight of that weekend was a fabulous meal at the Porthminster Beach Café, and so when I learned the same team were opening a new restaurant in the Bedruthan Steps, I was understandably excited. Had the Red Herring lived up to the promise of the Porthminster Beach Café I would probably have given it its own post but alas, it seems the style and panache of the Porthminster haven't translated very well to Mawgan Porth. It's not that any of it was inedible (nearly), but the Herring was an altogether less focussed affair. Perhaps that's what happens when you move from your own building to a hotel restaurant - I've heard of even the fanciest London hotels imposing their own suppliers on reluctant chefs, and of restaurant owners cutting corners to squeeze a profit out of sky-high hotel rents - but the Herring felt like a tourist hotel restaurant, not an impression I took away with me from the Porthminster Beach Café at all. There were issues with every course at the Herring, but very briefly - 3 oysters is not enough food for a starter, and these were dry and pointlessly topped with bits of chewy parma ham; fresh Cornish crab was certainly that - fresh - but contained a bit too much soily dark meat and I don't think it needed much of the veg underneath it; slow-cooked lamb had decent flavour but could have done with losing either the celeriac remoulade (which I think also contained coconut? Very bizarre) or the cold ratatouille, the combination of all of that was a bit of a mess; and finally a piece of hake was overcooked and mushy, topped with a pointless slab of impenetrable chorizo and accompanied by three dense, floury and disgusting "herb dumplings". Cheese course was nice enough and I guess £35 isn't a fortune for 3 courses, but it was all just too odd to recommend. Thank God for That View, then. That View makes everything better. 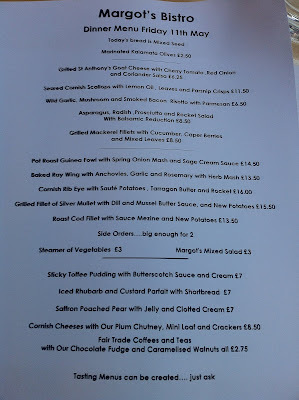 We did eat well in Cornwall, but not in the Bedruthan Steps and not in Mawgan Porth - fortunately a little bistro in nearby Padstow restored our faith in Cornish cuisine, but I will leave that for another post. And I imagine most people, who are on holiday to enjoy themselves and don't have the twisted attitude of a London food snob, would have enjoyed the food at the Herring just as they might have enjoyed their warm, cloudy vodka martini in the bar beforehand. But I'm afraid it wouldn't be fair if I judged a gratefully-received freebie any differently than if I'd paid for it out of my own pocket, and if your four-star hotel serves inadequate food and bad cocktails then you are doing something wrong. The real star of the trip, then, was Cornwall itself. On Saturday afternoon, a strenuous cliff top walk north along the coast brought us to a teeny National Trust property perched alongside a series of dramatic coves. In keeping with most of the rest of the weekend, the food wasn't great - a Cornish pasty was soggy and served in strange bready pastry, and afternoon tea came with cold scones and not enough cream and jam - but the sheer beauty of the surroundings and the relentless charm of everyone we came into contact with meant it was impossible not to enjoy ourselves. On the walk back, snakes basking in the afternoon sun scuttled away as we battled our way up the steep path back to the hotel, and having showered and changed we rewarded ourselves with champagne cocktails at the Scarlet. Accompanied, of course, by a long loving gaze on That View. Maybe there are more important things than food, after all. I was a guest of the Bedruthan steps. Return first-class rail tickets provided by First Great Western. If I was feeling slightly less than charitable, this post would be about Colchis, a Georgian restaurant in Bayswater. 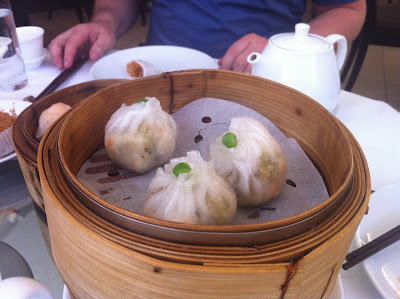 I went with a couple of friends on Sunday and suffered the kind of incompetence that makes the job of writing it up a breeze - the wrong wine brought twice, dull food weirdly presented, and the saltiest dumplings in Britain. I could have rattled a condescending review off in record time and had the afternoon to find somewhere else to hate while the comments racked up. But you know what, there's been far too much Schadenfreude around these parts lately. I know bad meals make good reading but while I don't mind laying into a Jamie Oliver cash cow or cynical tourist dive, I am less comfortable with beating on yet another mediocre-but-hardly-disastrous meal from people whose intentions may well be misguided but hardly evil. Not everywhere can serve the best food or be incredible value, and it's far, far to easy to pick fault in somewhere that isn't perfect than it is to appreciate that actually, we have it pretty good most of the time. So, from now on, I'm going to try and be more positive. 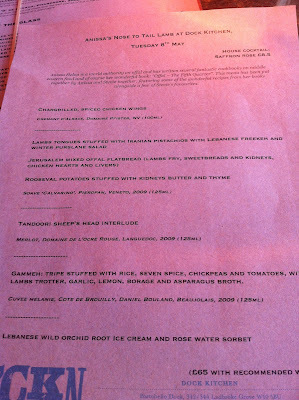 Anyway, the reason I've been in such a conciliatory mood lately is largely due to a meal I had at the Dock Kitchen in West London earlier in the week, a special one-off event and the brainchild of Syrian/Lebanese food writer Anissa Helou with the assistance of Dock Kitchen chef Stevie Parle and his team. 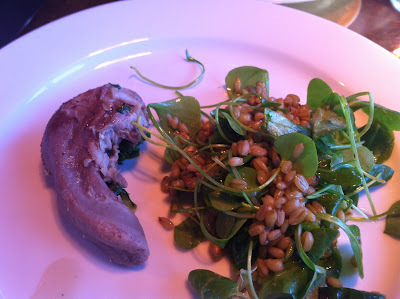 Ordinarily writing up one-off events is the least useful thing a food blog might do - it's not like anyone reading this will be able to book themselves in for similar any time soon - but this meal was just so ...unusual, that I thought it deserved a proper report. 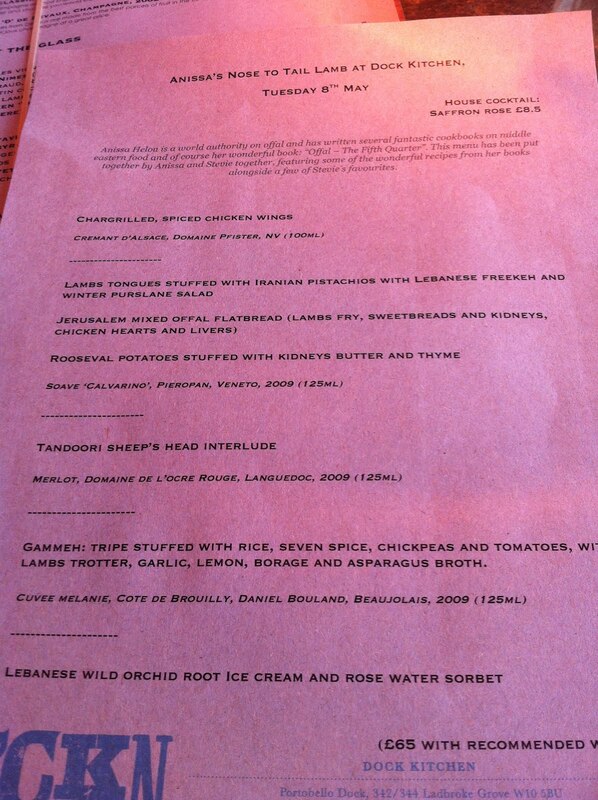 There are two points to be made before I go any further - firstly, the meal was titled 'Nose to tail lamb', and as you might expect contained bits of a sheep you wouldn't ordinarily see on a restaurant menu. 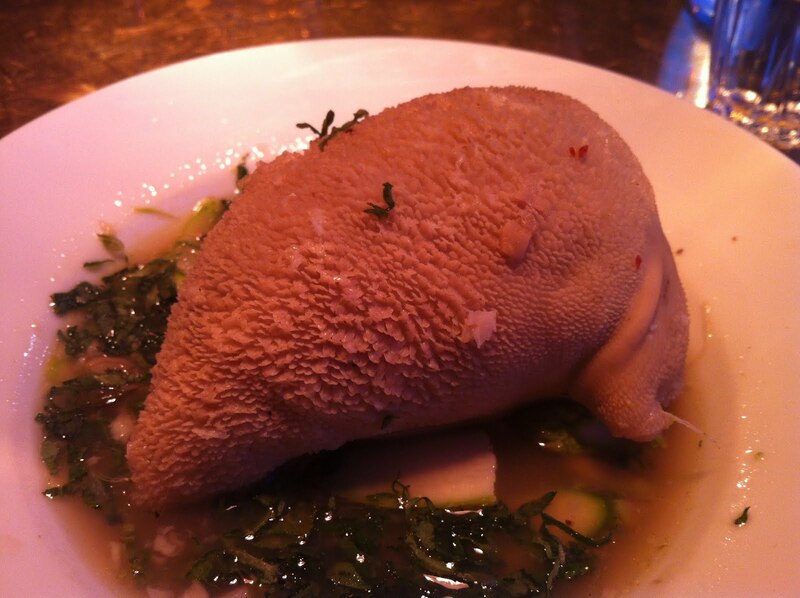 If you are feeling a bit delicate and your idea of a difficult dish is a haggis, then look away now. Secondly, despite containing some of the most challenging items I've ever paid to eat, it was worth every penny even despite the fact there were some bits I will never ever go anywhere near again. Ever. It all started innocently enough. Chicken wings, marinated I think in pomegranate molasses, were straight from the charcoal grill, salty and sweet crispy on the outside and silkily smooth within. 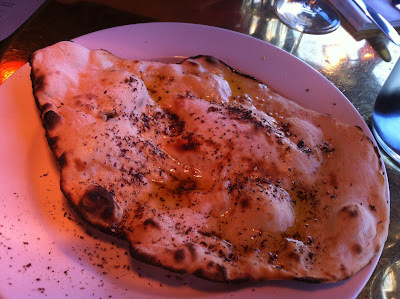 The house bread also deserves a special mention, this presumably being Stevie Parle's work, with the soft, stretchy texture of the finest tandoor-cooked naans. This is a lamb's tongue. It's not pretty, is it, but surely that's just a few decades of social conditioning talking - objectively it can't really be more obscene than a salami. It tasted salty and soft, not very offally in fact but rather like dense paté, and if you closed your eyes would almost pass as straightforward. Almost. This roast potato contained a whole kidney seasoned with butter and thyme, and I was on safer ground here as I'd had kidneys in the past. 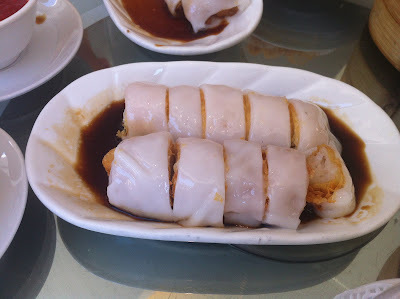 Admittedly, I didn't like them much when I had them before - it was in Canteen in Spitalfields and I remember them tasting like, well, for want of a better word, like piss... actual piss - but here they were much more palatable, soft and meaty and with no unpleasant urine tang, just a vaguely musky tinge of innards. 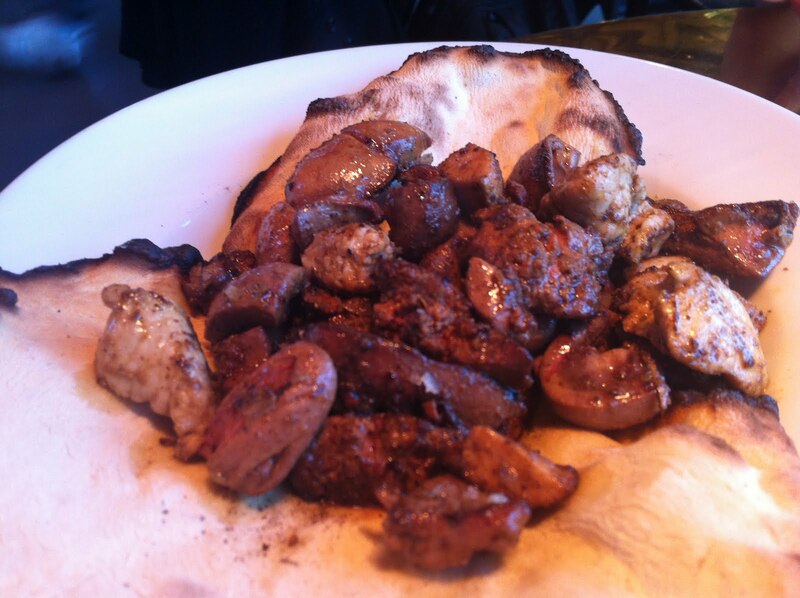 Finally, our favourite of the starters - another soft and crisp flatbread topped with lamb's fry (liver), sweetbreads and kidneys, and chicken hearts and livers. All delicately spiced (allspice, I think) and perfectly seasoned, this Mixed Organ Grill was great fun to pick your way through - my favourites, as in the past, were the chewy chicken hearts and the creamy blobs of sweetbread. 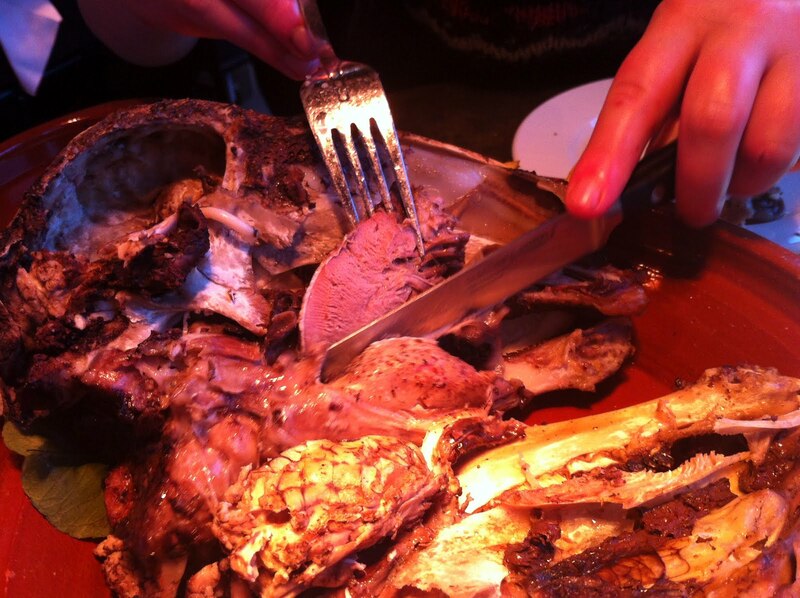 It was enough to forget I was working my way through minor lamb glands and let my guard down. Big mistake. 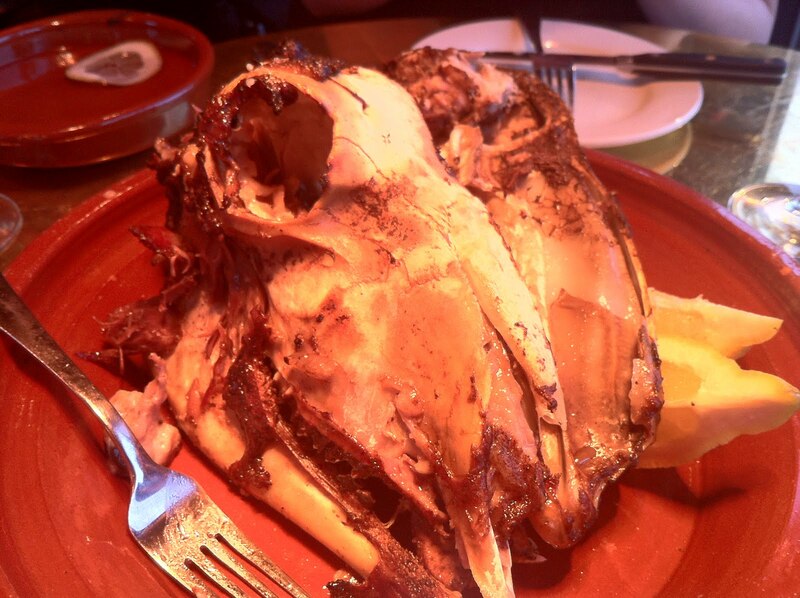 "Tandoori sheep's head interlude" sounds like a good name for a band, but is actually, as you can see from the X-rated photo above, an actual entire sheep's head, eyes and brains included, on a plate. To eat. Anissa gave a brief demonstration on how to *gulp* split the skull, *wince* scoop out the eyes and *aargh* fish out the brains with our fingers, during which I attempted to appear polite and pay as much attention as possible whilst simultaneously fighting the instinct to run out of the room screaming. Since a humbling trip to Japan earlier in the year, involving raw squid and cod's sperm, I no longer consider myself the brave Mr. Mange-Tout I once did, but even so, I surprised myself at how unnerved I was, staring into the dark, sunken eye sockets of a roast animal skull. 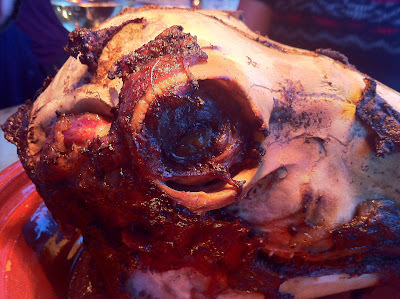 I first tried some cheek - "hmm, not bad" - then graduated to a teeny morsel of brain - "eek, well, OK" - but it was really the eyeball that I was most worried about. 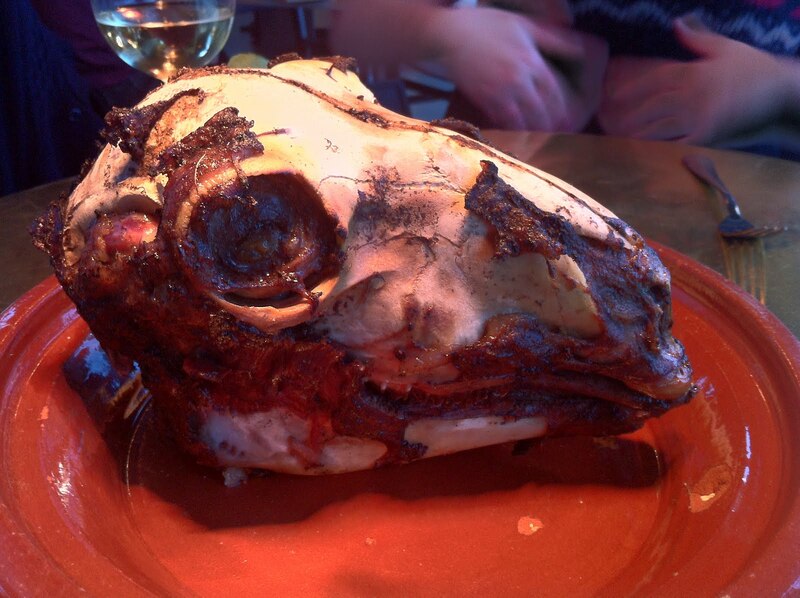 I stared at my dinner, and it stared back. I took a few deep breaths and, as instructed, sliced off the dark iris with a knife and fork. The two sections wobbled apart looking like nothing that should ever be eaten. I should say that my friend, much more brave and level-headed than me, was tucking into her side of the head with gusto - not only did she pop the entire eyeball into her mouth as if it was nothing more offensive than a marshmallow, but she also ate most of the tongue and was tearing at the brain with her fingers for as long as the front of house left it on the table. Eventually, under extreme peer pressure I should add, I tried a tiny bit of the eyeball. It tasted like salty lamb blubber, perhaps very slightly less hideous than I'd expected but still not enough to get me rushing to my nearest halal butchers and buying them out of whole carcasses. After that, a whole stuffed stomach was almost prosaic. Gently pungent tripe, ballooned with spiced rice and herbs, sat in a clear vegetable broth containing garlic and lemon and crispy asparagus. I can't decide whether it was over-eating or shell-shock but I'm afraid I couldn't manage more than half of it. Very tasty though, I assure you. Rose water sorbet and Lebanese wild orchid root ice cream provided some kind of light relief at the end of the meal. I ate them feeling like I'd just been bungee jumping, or white water rafting - a combination of having broken some personal limits and delighted I'd even eaten as much as I did. And yes, I struggled with some bits of the meal, as I imagine many others would too, but I can't remember the last time I've finished a meal feeling such a sense of a achievement - pathetic really, as there must be people all over the Middle East tucking into a whole sheep's head like you or I might a Cornish pasty. So, thank you to Anissa and Stevie for having the balls (which reminds me, I guess it could have been worse) to do this, and for treating me and my friend to a completely hilarious, terrifying, delicious and utterly unforgettable evening. 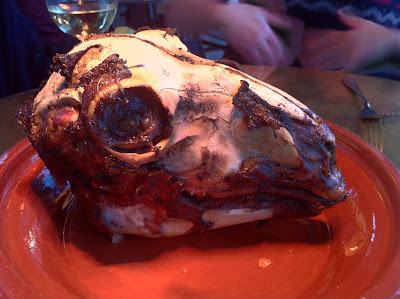 I'm never going to be the world's biggest fan of the strange collection of objects that lurk inside a sheep's skull, but by cooking it all so well - always delicately spiced and perfectly seasoned, not a single mistake in any element of any course - they have at least convinced me that this is as good as this stuff gets, and I can safely now stop trying. And I can't tell you how much of a relief that is. 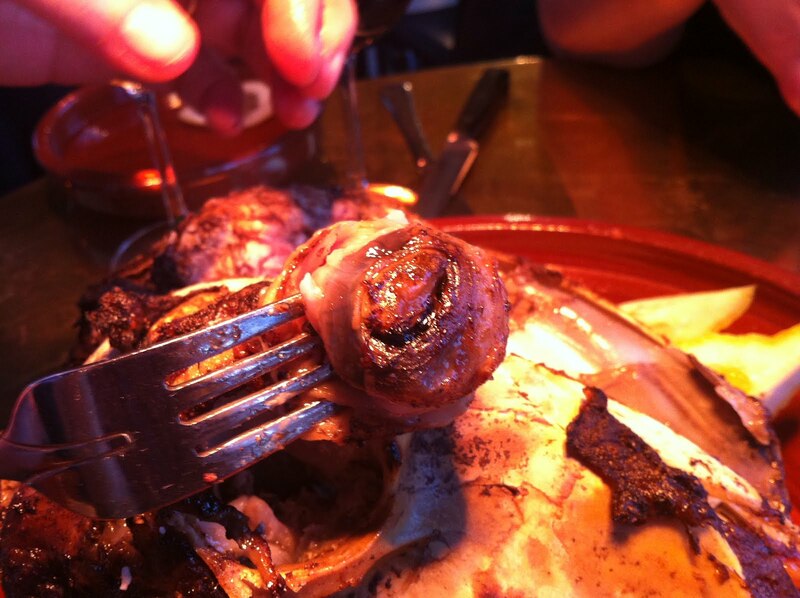 Edit: Apparently lamb's fry were testicles after all, not liver. So I did better than I thought.